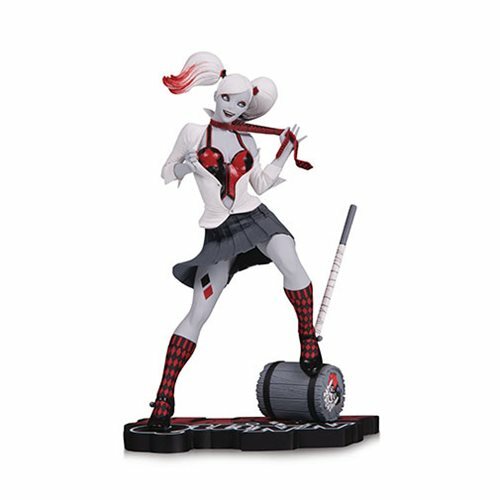 Crafted from the artwork of Guillem March, a multifaceted artist who has produced multiple covers for Harley Quinn comics, this entry in the Harley Quinn Red, White and Black statue line brings a playful, minimalist-tone to the Maid of Mischief. Yet with the detailed design and splashes of color, this figure remains unmistakably Harley. Outfitted in a traditional school uniform-complete with argyle socks-and equipped with her trademark oversize mallet, this carefully crafted polyresin statue is a limited edition of 5,000 pieces. The Harley Quinn Red White and Black by Guillem March Statue measures 6 3/4-inches tall.